When using a computer, you often want to have videos running in the background. You may want to listen to music videos on Youtube while browsing the web, or watch an educational video while taking notes. People often want to watch videos casually in the background with the ability to shift their attention to other tasks as necessary. Up until now, that wasn’t easy to do on the iPad. If you want to watch a video, you must have the app it’s playing in open and active. As soon as you try to open a new task, the video will pause until you return to it’s app. In iOS 9, supported apps can add a new button to the video player controls of their content, allowing the user to pop the video out of the app to run in a “Picture in Picture” mode. In this mode, you can move the video around the screen of your iPad, and it will keep playing as you do other tasks. 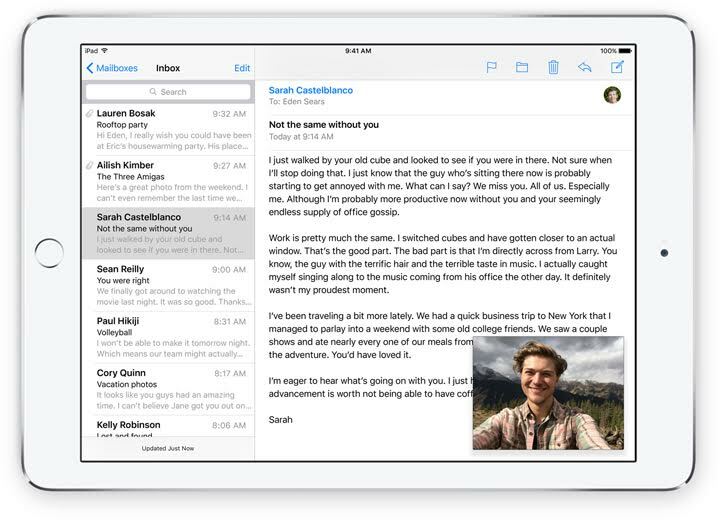 Another way Apple is improving iPad multitasking in iOS 9 is through a “Slide Over”. While Picture in Picture is great for videos, Slide Over allows you to switch between other tasks more easily. In iOS 9, you can swipe from the right edge of the screen to bring up a small panel with a second app. While in this mode, your primary app becomes dimmed and inactive while you interact with the newly launched app. The Slide Over will always take up a fixed amount of the screen, about the width of an iPhone screen. You can swipe from the top of the Slide Over change between apps, and then swipe the panel closed to return to your primary app. With this new functionality, you can quickly open a note pad and keep notes while you read through a text book, quickly launch your music player, or keep a text conversation just a swipe away. When you are done with the Slide Over, you can swipe it closed and your original app will become active again. Although opening an app in a Slide Over is convenient, it still isn’t perfect. You can quickly view a second app in a Slide Over, but it will obscure the app you were previously looking at. That’s why Apple added a third multitasking feature; “Split View”. 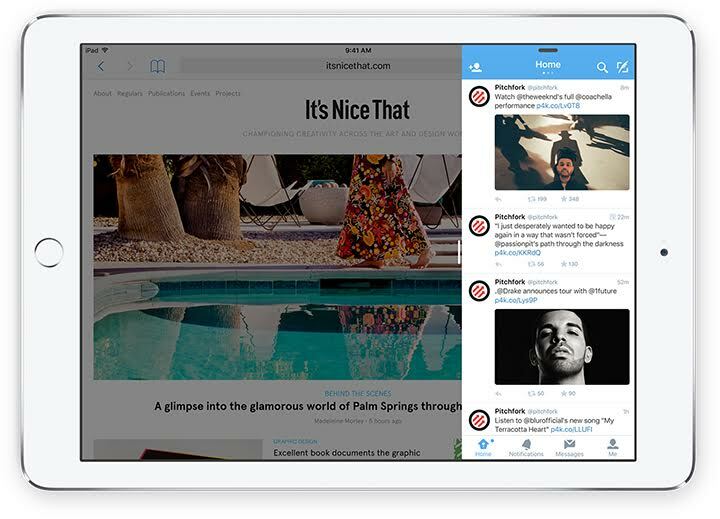 Split View is a new multitasking feature currently available only on the newest iPad Air 2. On This device, when you open a Slide Over, you will have the option to dynamically extend the window to take up different amounts of space. In this mode, it will resize the app you were previously using so that both apps can be active at the same time. You can directly interact with both apps simultaneously. as well. Unlike a Slide Over, you don’t have to shift your focus between the two activities, they can both exist and run simultaneously. Third party apps will have to be updated to support Slide Over and Split View, so only Apple apps will be available to multitask this way at launch, but Apple is encouraging every new app to support these new multitasking features. It’s likely that within a few months after iOS 9’s release, most popular apps will be updated to support these new features. You will likely soon be able to browse the web with your twitter app taking up a portion of your screen, while a YouTube video plays in the corner. 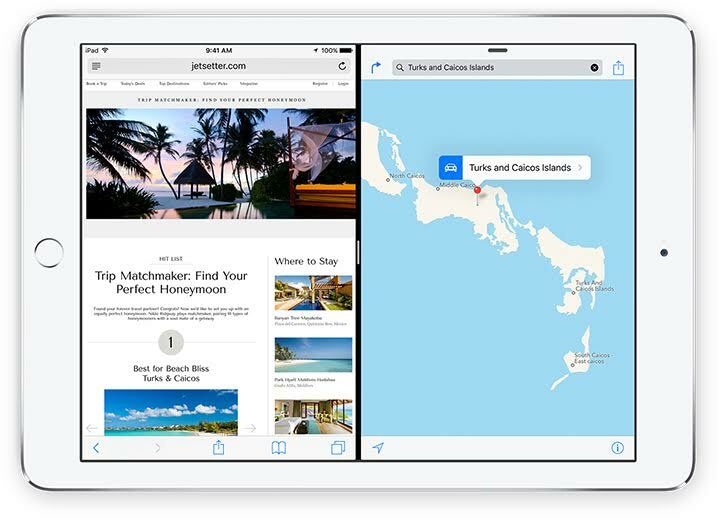 For the first time, true multitasking will be available on the iPad.